Shibuya Halloween Party 2015 - Pictures & Video! Halloween has blown up huge in Japan in the past few years. A researcher with Mitsubishi UFJ told the Associated Press that there were expected to be 20,000,000 Japanese Halloween revelers in 2015 spending a total of over US$300,000 on the holiday. Those massive numbers have ensured that Japanese companies are already making plans for more Halloween growth in the coming years. The biggest Halloween Party in Tokyo is the Halloween night street party in Shibuya – where hundreds of thousands of costumed revelers pack the streets from noon Halloween day to 6am the next morning. The crowds were so huge last year that the Tokyo government deployed nearly 1,000 riot police to help keep things under control this year. In Japan, riot police are most often used to keep order in a friendly manner, and that was definitely the case on Halloween night. Though the crowds were much bigger than last year, and the scene was chaotic at times, the overall feeling on the street was one of fun, friendly, and peaceful celebration. Shibuya Halloween Street Party 2015 Video – Please Watch! In 2015, Tokyo Halloween reached a milestone when the city’s governor held a press conference asking people to be safe and cleanup after themselves during this year’s Halloween festivities. It’s not uncommon in Japan for the powers that be to push back against “unofficial” events or celebrations. The speed at which Halloween reached a critical mass – and that both government and business decided to support it – has been astonishing. Also new for Tokyo Halloween this year were the trash cleanup brigades that decended on the city early the morning after Halloween. Cleanup crews sponsored by various business, clubs, and other groups gathered in the places where all-night street parties were held to tidy up after revelers who may have left anything behind. In Shibuya, there were several groups cleaning up after the city’s biggest Halloween party, the most famous of which was the “Shibuya Halloween Ghost Busters”. 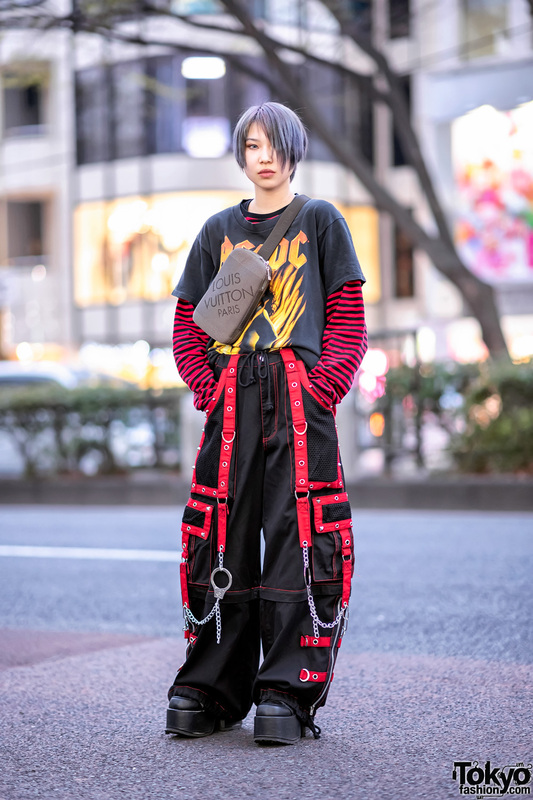 Decked out in costumes inspired by the classic “Ghost Busters” movie, and led by famous Japanese comedian Akihiro Nishino, the cleanup crew fanned out across the Shibuya at 6am Sunday morning – cleaning up the streets before most of the city awoke. Though not as stylish (or hard working) as the Ghost Busters crew, the Tokyo Fashion crew spent many hours on the streets of Shibuya on Halloween and the preceding days. We had a lot of fun shooting hours of video and thousands of photographs of what we believe to be the biggest Halloween street party in the world. We are very happy to share the fun of the Shibuya Halloween Street Party with you again this year! If you’re ever thinking about visiting Japan in autumn – and you like Halloween, large street parties, cosplay, or just seeing something amazing – we definitely recommend that you consider spending Halloween in Tokyo. There is nothing like it! Happy Halloween everyone, and a big thank you to all of the people we met and photographed during Halloween 2015. And an extra special thank you to the Shibuya Halloween Ghost Busters – and all of the other cleanup crews who dedicated their valuable time to make sure that this year’s Halloween street parties were the cleanest ever! Also check out our Halloween Eve in Tokyo 2015 Photo Gallery!